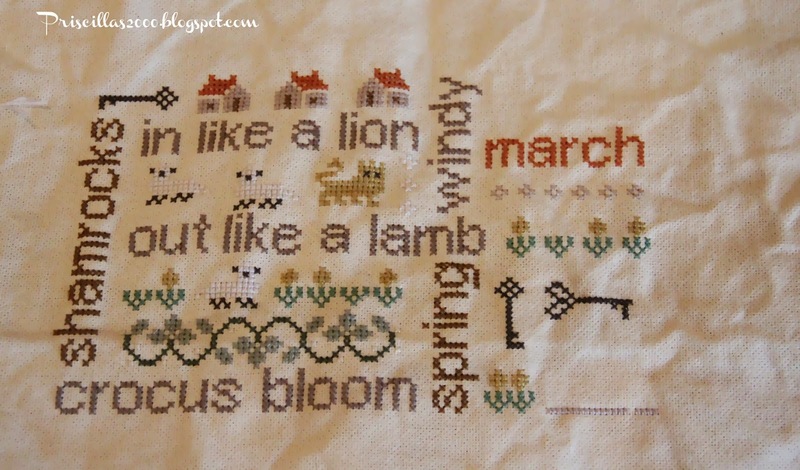 Priscillas: More Scarves, Stitching ,Spring and Hobby Lobby ! Good morning ! Hope you have had a great week ! I have been making more of these infinity scarves..This time with a baseball applique! Aren't they too cute !?! These are for a blogger/instagram friend ..They were her idea , but I am going to steal that idea and make a football applique for myself :) I have 2-1/2 done ..2-1/2 more to go ! Stitching on March right now, I am not loving the burnt orange color and think its going to be replaced with another color of green.. While at Hobby Lobby to get more navy yarn for those scarves, I wandered to the clearance section at 90% off ! 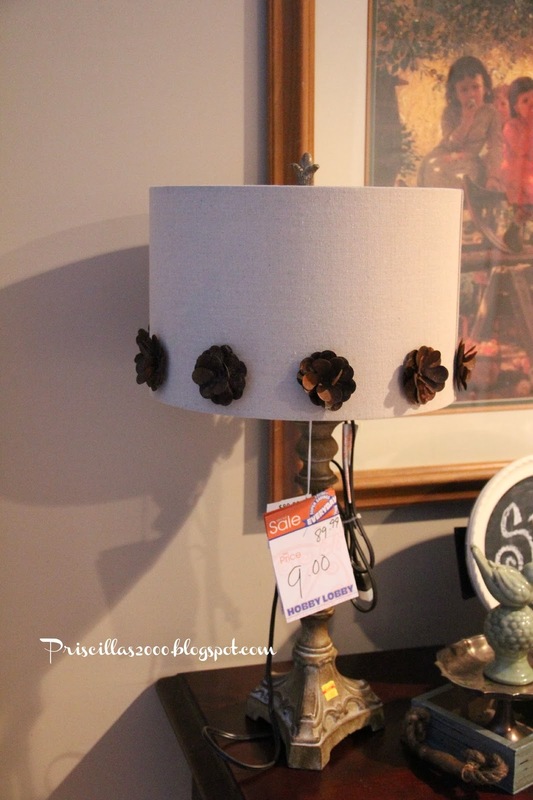 These pillows were $99.00 for $9.99 ..
And this lamp...$89.99 for $9.00 ! 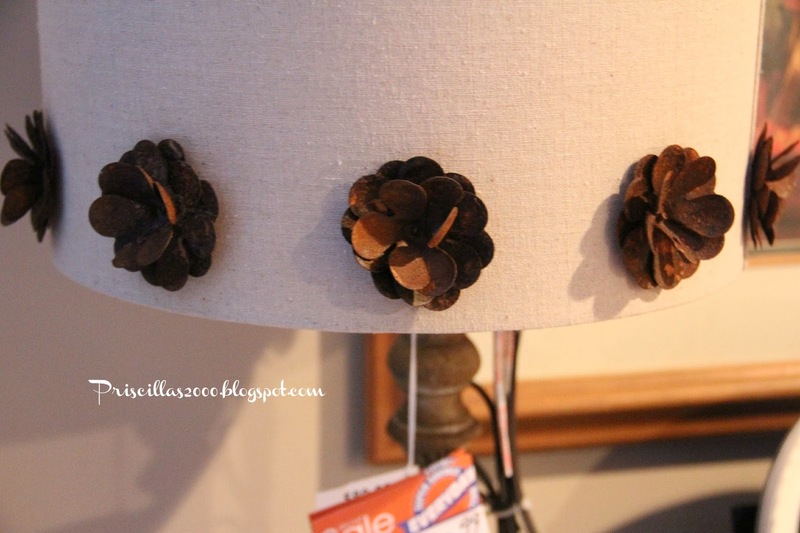 I think I am going to use it in the spare bedroom that we are getting ready to repaint and decorate ! Isn't it fabulous ! Love the little rusty flowers ! I have been Springing up the house even though it has been below zero ! So cold ! Our village workers came yesterday and removed the huge pile of snow from our yard .. I wonder if its because we are supposed to get more snow this weekend ??? I love this wrought iron tiered basket I got at an Estate sale.. 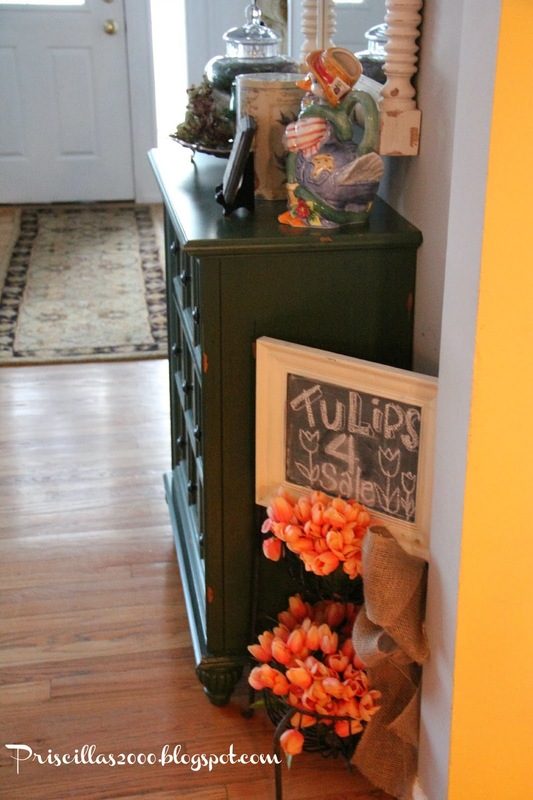 I filled it with tulips from Michaels , made a chalkboard sign , and added a burlap bow. Thanks so much for stopping by ! I love your visits and nice comments ! Hi Priscilla. What a great idea for the scarves. I love them! It is raining crazy hard here today. We need it SO badly. I want to thank you for your kind words, and prayers for my Mama. We are holding on....and keeping our faith. Get some good stuff today at the sales!! Wow!!! You certainly got some bargains, there, the cushions and lamp are really nice. 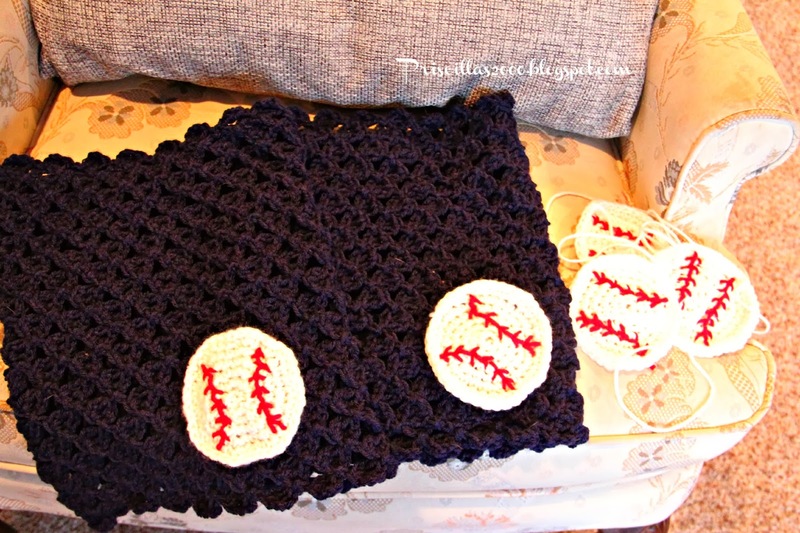 Your stitching is beautiful, as always, and I love your scarf, such a great idea to finish them with baseballs!! Have a great weekend, keep warm, we're expecting a little snow too, but just a dusting. You are doing a great job on all the Word Plays. The more I do , the more I change some of the colors. In the beginning I used the suggested colors. Now when I get them out, I wish I had changed some of the colors and designs! Good for you! 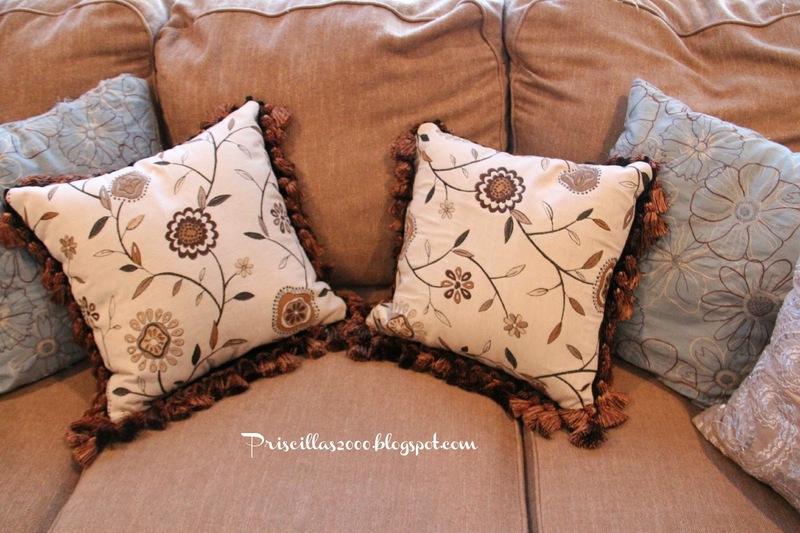 Nice Spring touches to your home. 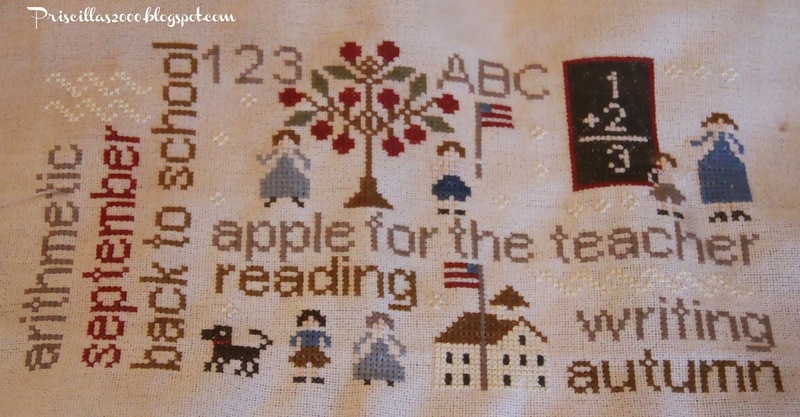 I've been looking over your most recent posts ~ I am so behind in my blog reading ~ and of course I had to comment on this one!! Love, love, love the scarves ~ and with as cold as it has been, these will be well used for the early spring games! First tournament in two weeks! !